A return to the world of musicals inbetween trips top two operas. When the advert says “Tony Award Winning Show”, you should always beware that this can be entirely false advertising. In this case, it was the cast in a revival run that won the awards, and not, strictly speaking the show. Frankly, that’s no surprise. Although the script was peppered with the astute comedy you’d expect from a show based on the Peanuts comic strip, it has no real substance. The show is constructed essentially as a sketch show linking reenactments of the comic strips by theme, and using songs where appropriate to move the action along. There is nothing really innovative, or exciting about the show, and the lack of central plot leaves nothing behind after the laughter has faded. Ostensibly, Charlie Brown goes on a journey to find out if he is a good man, but there is no real development of this theme in the show, and his journey just ends with Lucy telling him he is one before the curtain falls. None of these failings in the show itself should detract from the fact that the original source material is excellent and as a result is not an unpleasant way to spend a couple of hours. However, the show leaves no lasting impression and is easily forgotten. It’s regular revival can be attributed primarily to the small cast and simple staging, as well as a nostalgia for Peanuts. If there was a deeper point or message it was too well hidden. The EUSOG cast were a mixed bunch. I’m given to understand some of the parts have been double cast, so the second cast might be stronger. I was also given no cast list, and the EUSOG website did not give one either. 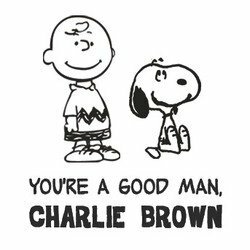 The actor playing Charlie Brown did a sterling job in the opening as he responded to various voices off stage. This nuanced portrayal of the unconfident Charlie was sustained throughout the performance. The actor’s singing was good and could be heard clearly for the most part. The two women taking the roles of Lucy and Sally also did a very good job of characterisation, and both sung well. Lucy’s tendency to sing deliberately off-key was both well executed and a tad grating by the end of the show (though I think this is how the part is normally played). Sally was by far the strongest vocalist to the point where her voice stood out in group numbers. The other three, Linus, Schroeder and Snoopy, were significantly weaker. All of them sung songs during which some or all of the words were completely lost because of their inability to project sufficiently for the space. Their acting and characterisation were good, but not enough to make up for many words being inaudible. The show itself is light and enjoyable, but is by no means Broadway’s finest hour. More importantly, the cast suffered heavily from a lack of microphones on a very deep and acoustically dead stage. This was not the right venue for this show, and it demonstrates the importance of the getting the right relationship between the group, their show and the venue. If you are a fan of Peanuts or like that genre of humour, you will likely enjoy this show, but otherwise I found little to recommend it when there are many other much better shows around. This entry was posted in Musicals, Reviews and tagged 2 stars, fringe 2013, musicals, reviews on 15th August 2013 by .